ETAC Code Generator 1-0.1-2-ena Free Download - The ECG uses text templates to generate and maintain any kind of text file. The free ETAC Code Generator, written in the ETAC programming language, is a highly advanced programmable template-based universal text and program source code generator that uses a template language with capabilities extended by ETAC programming language scripts. The user specifies a template file and input arguments, either on the command line or in the input dialog box, to generate and maintain any computer program source code and other text files. A template file is written in a unique sophisticated declarative template language ('ECGL') containing special descriptive codes in the form of keywords and their arguments intermixed with special symbols and the text to be generated. During the processing of a template file, the special symbols are replaced by the corresponding possibly modified input arguments. ECGL incorporates the ability to use the procedural language ETAC for producing specialised output where required. ECGL can also read and maintain existing or generated text and template files as part of its processing, making it suitable for updating code fragments of computer program source files. 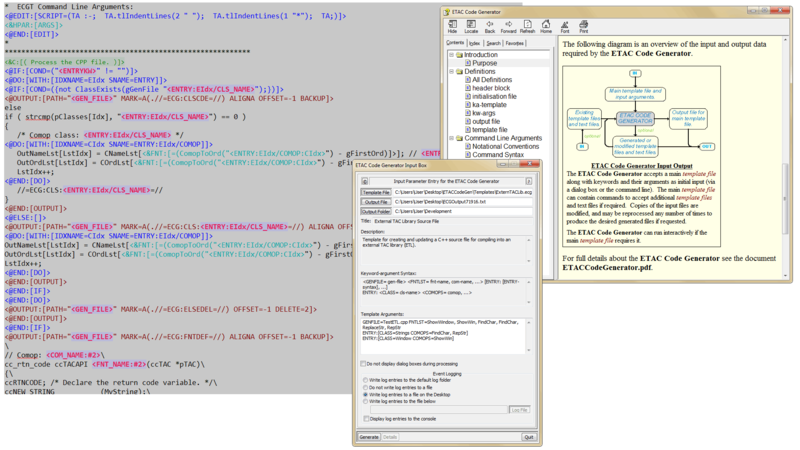 The ETAC scripts in a template file can utilise the full power of the ETAC programming language, and can communicate with the ETAC Code Generator via ETAC functions to access and modify various properties of the components of a template file, such as the values of special symbols. The ETAC script utilises ETAC's interactive debugger for visually tracing the activation of script tokens when running in debug mode. The ETAC Code Generator package comes with off-line detailed documentation along with ten template files and the full source code (available via the Run ETAC Scripts package). No internet connection is required for operation. Statement: First, please download the orginal installation package by clicking the download link. Of course you may also download it from the publisher's website. Using ETAC Code Generator crack, key, patch, serial number, registration code, keygen is illegal. The download file hosted at publisher website. We do not provide any download link points to Rapidshare, Hotfile, Depositfiles, Mediafire, Filefactory, etc. or obtained from file sharing programs such as Limewire, Kazaa, Imesh, Ares, BearShare, BitTorrent, WinMX etc. Software piracy is theft. If you like ETAC Code Generator please buy it.